Looking for interesting gluten-free bread recipes? You may think that focaccia is off the menu, but as Victoria shows, this delicious no-knead easy bread can be part of a gluten-free diet. 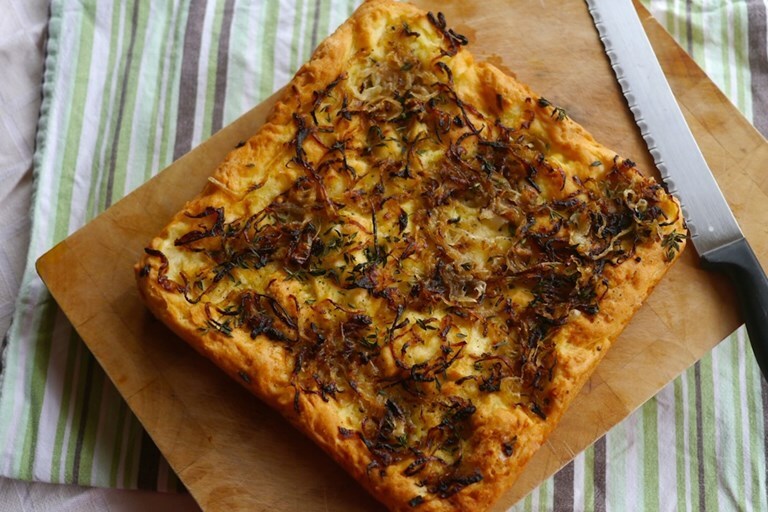 She tops her focaccia with onion and thyme, but other vegetable and herb combinations are also delicious. Interesting breads are often off the menu for gluten-dodgers. In fact, those following a wheat-free diet are usually lucky to be offered so much as a gluten-free crumb in most places, much to the constant dismay of my gluten intolerant boyfriend. After sharing a wistful reverie with me, which placed focaccia centre-stage in his most missed breads, I was determined to brighten his plate and create a more exciting receptacle for a slathering of butter. Gluten-free bread is the perfect choice for the idle or most puny of arm, as there’s no need to knead. Gluten-free dough is far too sticky to get that involved with and, besides, there would be little point. Kneading releases the gluten in wheat flour to make a stretchy, springy dough. As there’s no gluten to work here, kneading would only serve as a particularly messy way to combine the ingredients together. I set to work trying to calculate a way to recreate that oily, soft dough, peppered with bubbles of air that is characteristic of a wheat flour focaccia. I decided that adding a little bicarbonate of soda to the batter, fizzed up with acid (in this case vinegar, but lemon juice will also do the job) might help the yeast along with creating a nice, fluffy loaf. It turned out rather well, if I do say so myself, so I thought I’d share the recipe with you. You can top your focaccia with anything you like, from a simple scattering of sea salt, a few spikes of rosemary or a handful of sun-dried tomatoes and olives. I chose onions for mine, because I think they often get a rough deal. Onions seem forever doomed to play second fiddle to another, more starry ingredient, which is completely unjust, given how versatile and delicious they are. I used two small white onions and one red because that’s what I had in, but you can use whatever you like.